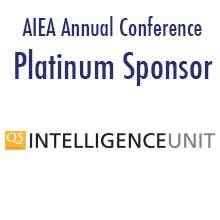 Serving on the board of AIEA is an opportunity for senior international officers to set the agenda for the future of international higher education. It is a phenomenal experience for networking, engaging with strategic-level issues, and for serving the field and all who are impacted by international education. The board is comprised of six officers (President, President-Elect, Past-President, Secretary, Treasurer, and Legal Advisor), seven members at-large, and five standing committee chairs (Membership Committee, Leadership Development Committee, Strategic Issues Committee, Policy Advisory Committee, and the Editorial Advisory Committee). The Executive Director is ex-officio. The Executive Committee is made up of the President, President-Elect, Past-President, Secretary, and Treasurer with the Executive Director as ex-officio. Board members at-large, committee chairs, and the President-Elect are all elected by active AIEA members. Each serve a three-year term, with the President-Elect serving three years on the Presidential Stream (President-Elect, President, and Past President). Committee members are selected by the chair of each committee and appointed by the current President. Unless specifically designated by the Board, a member cannot be a member of more than one of the five standing committees. Standing committees meet in-person on the Monday of the Annual Conference; other regular meetings are typically virtual or by phone. For more details, please refer to the AIEA Bylaws. The nominations committee chair sends an announcement to the member-only listserv with information for all open board positions, including President-Elect. Members are encouraged to self-nominate, or can also be nominated by a colleague. Nomination materials are collected by the Secretariat by a deadline as indicated by the nominations committee. The nominations committee determines which candidates will be slated on the ballot. The intent is that each open position will have two candidates, though this might not always be the case. In the event that a candidate is not selected to be slated on the ballot, the Executive Director or chair of the nominations committee will inform the candidate and, if applicable, the nominator prior to announcing the ballot. All active members are eligible to vote. Voting is conducted via electronic ballot. The ballot includes photos, short biographies, and a brief vision statement from each candidate. A simple majority of votes cast determines who has been elected. The nominations committee is comprised of the immediate Past President (chair), President, President-Elect, and Executive Director (ex-officio). The positions of Secretary, Treasurer, and Legal Adviser are non-elected positions appointed by the Board. Demonstrated leadership commitment with AIEA. Examples might include service on a committee or taskforce; past presenter of sessions or workshops at the Annual Conference; participation in the AIEA Leadership Academy for New SIOs; participation in the Senior Advisers Program; past host of an AIEA Thematic Forum; contribution of an AIEA publication; etc. Serving as a vice-chair on a standing committee does not guarantee inclusion on the ballot, but can strengthen one’s candidacy when the chair position for that committee comes open. Recognized leader in the field of international education. Examples might include holding a current senior international officer (or international equivalent) position, holding leadership positions in sister associations, publishing in the field, recognition for innovative programs, etc. Relevant experience or skills in organizational management. Examples might include communications, fundraising, finance, strategic alliances, strategic planning, etc. Positive leadership attributes. Examples might include emotional intelligence; ability to work collaboratively and engage in appropriate debate and discussion when needed; demonstrated ability to work effectively cross-culturally. Visionary and strategic thinker with demonstrated ability of new and innovative programs within their sphere of influence. Examples include, but are not limited to: incorporating strategy, leadership, future focus, risk taking, and an entrepreneurial spirit. AIEA board members are expected to attend two in-person (prior to the Annual Conference, and one in Durham, North Carolina) and one virtual board meeting annually. At-large board members are expected to serve on taskforces and contribute to board work. Committee chairs are responsible for recruiting members, facilitating committee meetings, designing and implementing strategic action plans, providing two committee reports annually, and shaping the direction of AIEA’s work in the committee area. Note that all board members cover their own travel costs in attending board meetings. President-Elect: Serves as Conference Chair, determines conference theme and subthemes, recruits and chairs conference committee, identifies conference speakers, determines themes for pre-conference workshops, oversees the call for proposals and session selection process, and oversees the conference. Serves as member of nominations committee, Presidential Fellows committee, and Thematic Forums committee, as well as the Presidential Stream. President: Leads all AIEA board meetings and yearly Associational meeting, presides over the Annual Conference, represents AIEA at conferences or key events for international education professionals as needed, and works with committee chairs to appoint committee members. Steers direction of the Association through Board leadership. Serves as member of nominations committee, Presidential Fellows committee, and Thematic Forums committee, as well as the Presidential Stream. Perform such other duties as may be directed by the Board. Immediate Past President: Serves as Chair of nominations committee, Presidential Fellows committee, and Thematic Forums committee. Serves as a part of the Presidential Stream, empowered by AIEA bylaws to make decisions in conjunction with the Presidential Stream when necessary and designated by the Board. Performs such other duties as may be directed by the Board. Chair, Membership Committee: This position coordinates the work of the Membership Committee, primarily focused on recruiting new SIO members both in the U.S. and outside the U.S. Chair also advises the Board on membership policies and makes recommendations from the committee to the Board regarding member-related issues. This Chair also serves as a member of the Presidential Fellows and Thematic Forums committees. Chair, Policy Advisory Committee: The Policy Advisory Committee responds to national policy issues impacting senior international officers, regularly prioritizes policy issues to be addressed by the Association, recommends and develops ways in which to address key policy issues, and educates Members on all levels of policy advocacy. Chair, Editorial Committee: This position coordinates the work of the Editorial Committee, primarily focused on developing and advocating for the editorial policies and priorities of the Association, including the review of proposed articles. Chair also advises the Board on editorial policies and makes recommendations from the committee to the Board regarding publication-related issues. The Editorial Committee Chair also serves on the Thematic Forums Committee. Chair, Leadership Development Committee: The Leadership Development Committee focuses on the development and delivery of programs that address the needs of senior international officers at Academic Institution Members and International Education Support Organization Members who are new to the field or who have recently moved into a new institutional context. The Leadership Development Committee Chair also serves as a member of the Presidential Fellows committee. Chair, Strategic Issues Committee: The Strategic Issues Committee regularly identifies and prioritizes strategic issues in internationalization that need to be addressed through professional development initiatives for senior international officers. The Strategic Issues Committee Chair also serves as a member of the Thematic Forum committee. At-Large Board Members: Board Members serve 3-year terms on the AIEA Board and provide leadership for policy and operational issues for AIEA. Board members commit to attending 3 Board meetings per year (at their own expense) and providing leadership to AIEA throughout their term, which may include chairing subcommittees, writing reports, proposing new events, and similar activities. The Board meets immediately prior to the Annual Conference, for a day-long meeting in the fall, and a virtual meeting during the summer.